A Marvel Character Might Appear in the Super Hero Taisen Z Net Movies?! Yesterday, we reported that a Tsuburaya character will make an appearance in the Super Hero Taisen Z net movies. Aside from that unknown Tsuburaya character, it seems one Marvel character might make an appearance in the net movies! 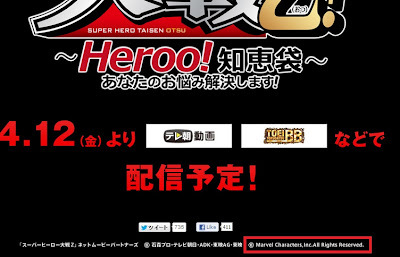 In a comment posted by Shogeco, he pointed out that the net movie site featured a text that says, "© Marvel Characters, Inc.All Rights Reserved." As we all know, Spider-Man is the only Marvel character that got a Japanese TV show produced by Toei! Does this mean we will see an actual cameo appearance of Japanese Spider-Man or the net movie will just make a reference of an old agreement between Toei and Marvel? A Tsuburaya Character to Appear in the Super Hero Taisen Z Net Movies! The upcoming Super Hero Taisen Z net movies will feature an appearance of a character from Tsuburaya Productions, best known for producing Ultraman! This isn't the first time a Tsuburaya character appeared in a Toei production. Notable appearances of a Tsuburaya character in a Toei production are Ultraman vs. Kamen Rider and an episode of Imagin Anime, which featured Ultraman Taro (pictured). 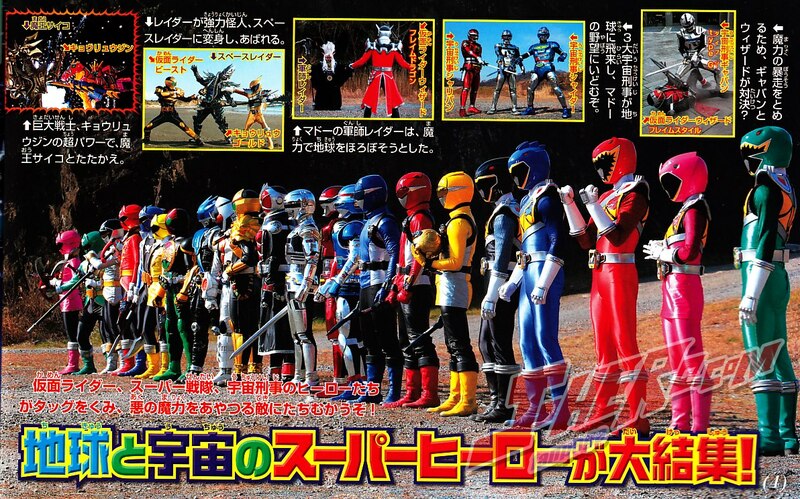 Net Version: Kamen Rider × Super Sentai × Space Sheriff: Super Hero Taisen "Otsu": Heroo! Bag full of Wisdom; Your suffering end will be released starting this April 14th. 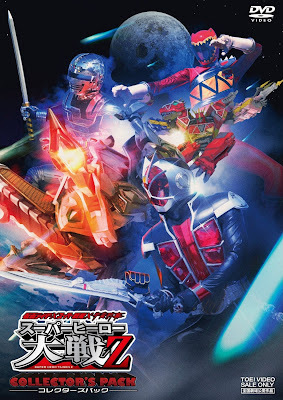 A new image for this year's crossover film, “Kamen Rider × Super Sentai × Space Sheriff: Super Hero Taisen Z” had been released featuring the combination of the three mechas in Space Sheriff Trilogy. 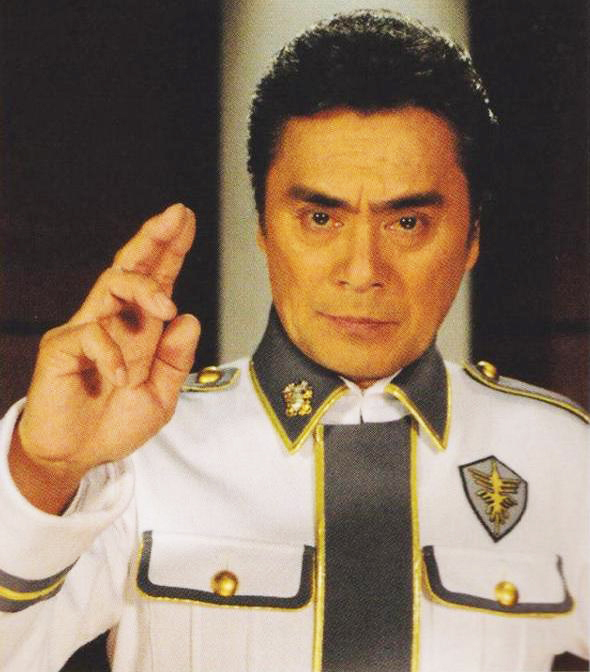 Forming the big magnum or cannon is Space Sheriff Shaider's Vavilos, and on top of it is Gavan's Dol Giran, while controlling it is Sharivan's Grand Birth. This once in a lifetime formation executes the "Big Grand Fire" finishing attack! Moreover, here's a clearer look at the combination of Zyuden Sentai Kyoryuger and Kamen Rider Wizard's powers. 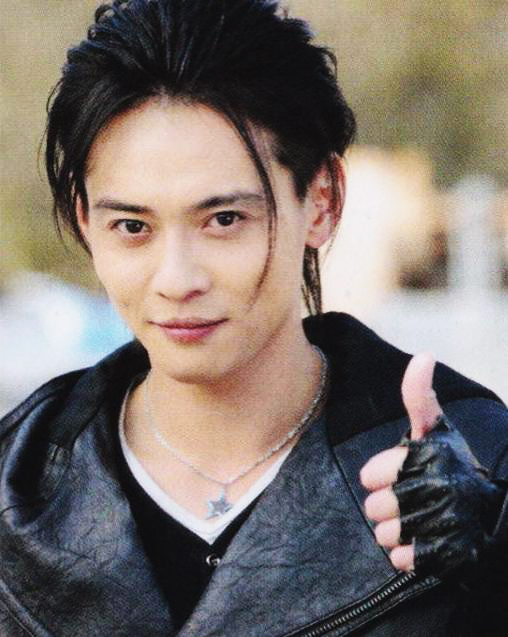 With the help of both Super Sentai and Miracle Wizard Rings, both performs the "Zyuden Brave Strike End" finishing attack against the Demon King Psycho. 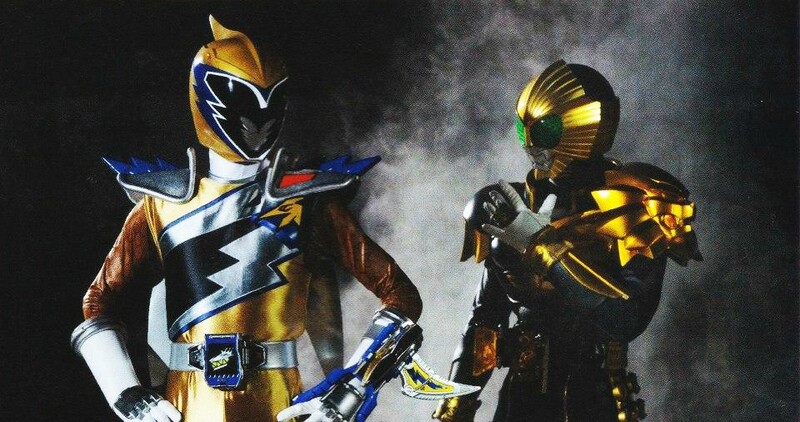 Metal Hero Keys in Super Hero Taisen Z! 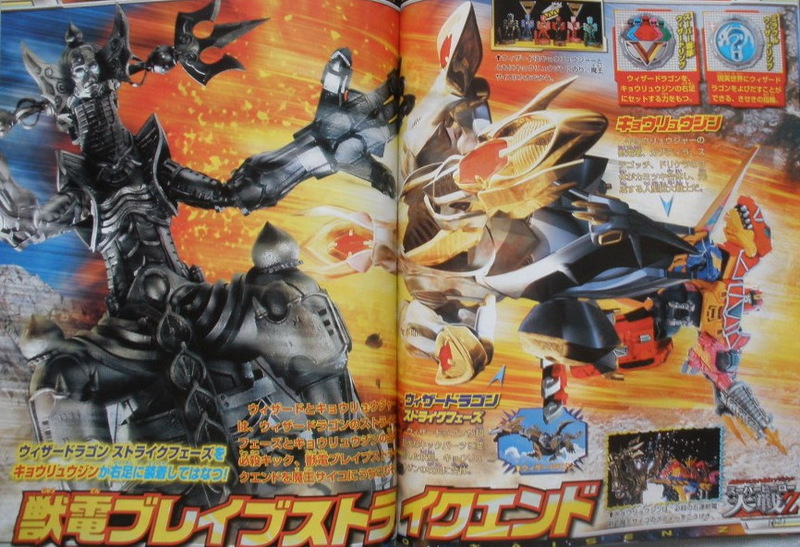 Newer scans for the other Metal Heroes that will appear in Kamen Rider x Super Sentai x Space Sheriffs: Super Hero Taisen Z has surfaced online. 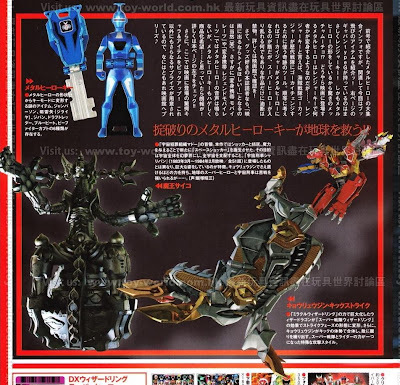 The new scans also confirmed that the Metal Heroes that will appear in the movie are just Gokai Changes! In the movies, the Gokaigers will use Metal Hero Keys to transform into the following heroes: Janperson, Jiraiya, Jiban, Draftredder, Blue Beet and B-Fighter Kabuto. 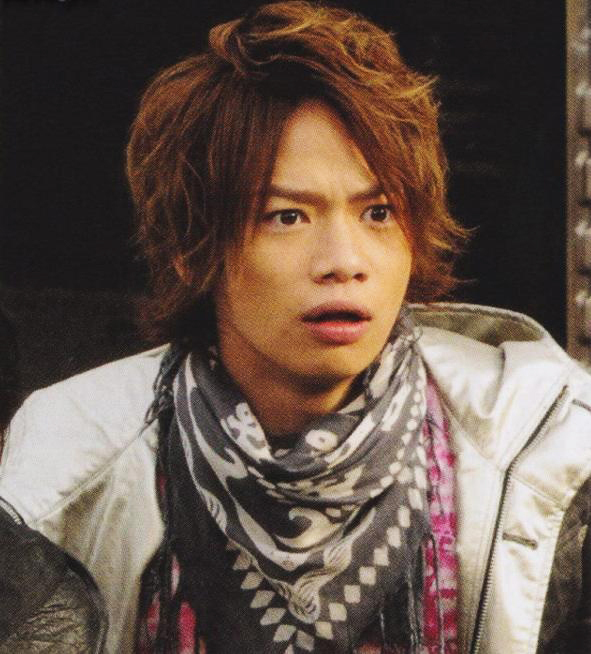 As for which Gokaiger will use what key, it is still unknown as of this writing. More images for this year's crossover film, “Kamen Rider × Super Sentai × Space Sheriff: Super Hero Taisen Z” were published on Japanese magazines. 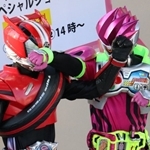 This shows the team-up between KyoryuGold and Kamen Rider Beast. 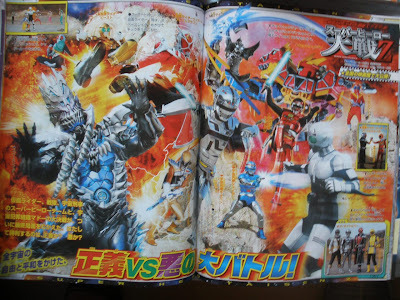 Also seen in the scans are the final line-up of heroes, Kamen Rider Wizard being attacked by Gavan, the members of the Galactic Union, Ikari Gai/GokaiSilver, and Psychoron. 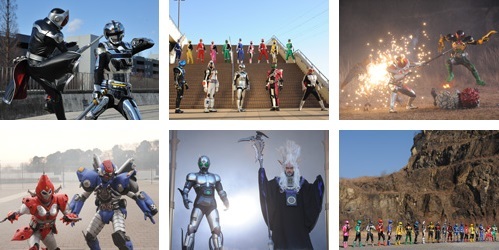 The official Toei production site for Kamen Rider Wizard and Zyuden Sentai Kyoryuger posted new images for the Kamen Rider x Super Sentai x Space Sheriffs: Super Hero Taisen Z movie. In addition, the sites barely has new info about the said movie. 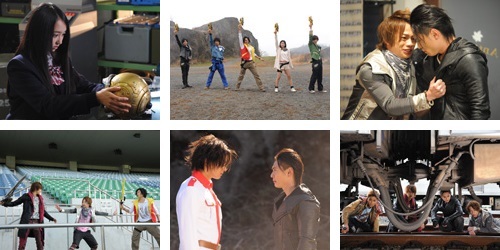 The official Toei production sites for Kamen Rider Wizard and Zyuden Sentai Kyoryuger posted new images for the Super Hero Taisen Z (Otsu) net movies! The site also revealed three toku actors who will voice their characters in this series of online comedy shorts. 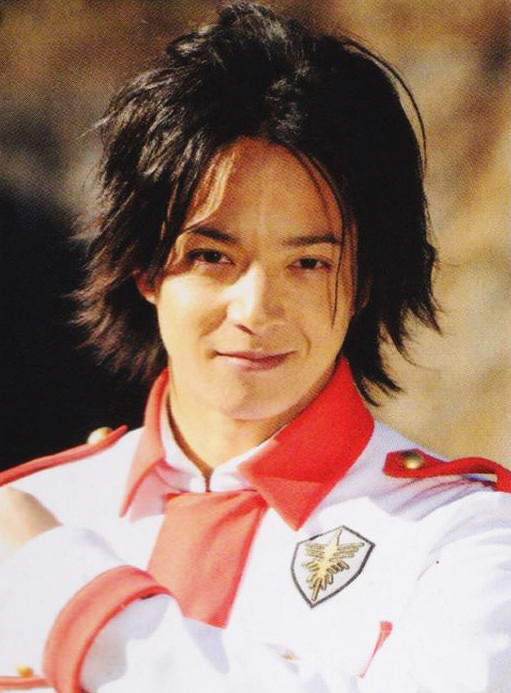 Joining Ryuji Sainei in the list of actors who will only have voice-only appearances in the net movies are Renn Kiriyama and Yuma Ishigaki, who will both reprise their roles as Kamen Rider W and Gavan typeG respectively. Sainei will reprise his role as DekaRed in the net moveies. In addition, the site also asked fans this question, "Who is playing Electrowave Human Tackle in the net movie?" They will reveal the answer to that next week. 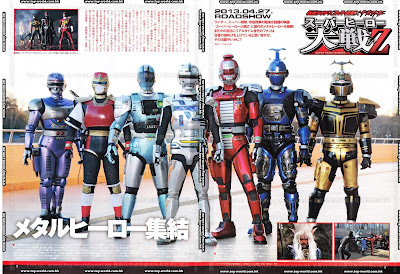 Spoilers for Kamen Rider x Super Sentai x Space Sheriffs: Super Hero Taisen Z has surfaced online. Though most of it are just impressions coming from fans, there is something that might interest us. To sum up their thoughts, it is better than the previous Super Hero Taisen, but there are still problems from the previous movie that still remained such as the action, the characterization and the story. 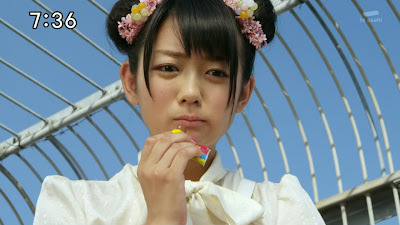 The only thing noteworthy about the movie is that Suzuka Morita did appear as Kotoha Hanaori aka ShinkenYellow! 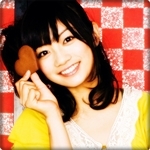 She appeared as Shelly for the entire movie except for a short scene wherein Shelly and Kotoha interact. 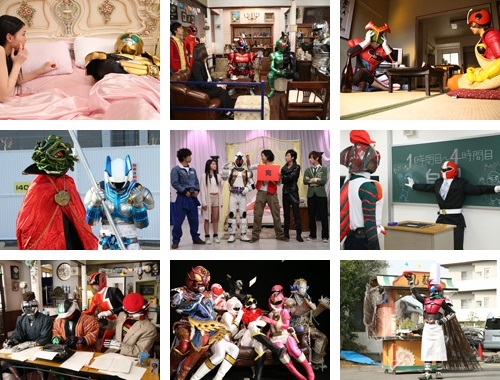 The official Toei production site for Kamen Rider Wizard and Zyuden Sentai Kyoryuger updated their Kamen Rider x Super Sentai x Space Sheriffs: Super Hero Taisen Z page, revealing that more characters from Tokumei Sentai Go-Busters will make appearances in the said movie. Katsuhiro Suzuki and Ryoma Baba will reprise their roles as Hiromu Sakurada aka Red Buster and Ryuji Iwasaki aka Blue Buster respectively. In addition, Hideo Sasaki, Naoto Takahashi and Fuuka Nishihara will reprise their roles as Commander Takeshi Kuroki, Toru Morishita and Miho Nakamura respectively. 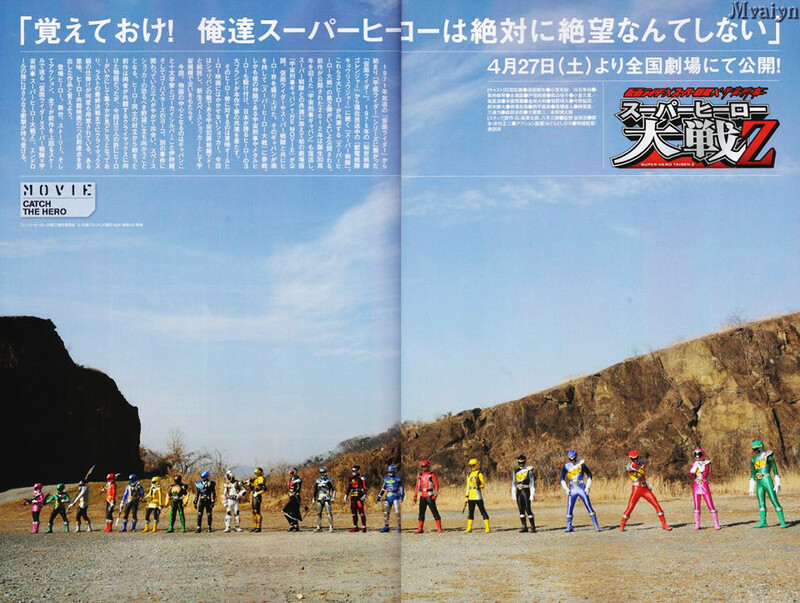 Kamen Rider x Super Sentai x Space Sheriffs: Super Hero Taisen Z will premiere this April 27. 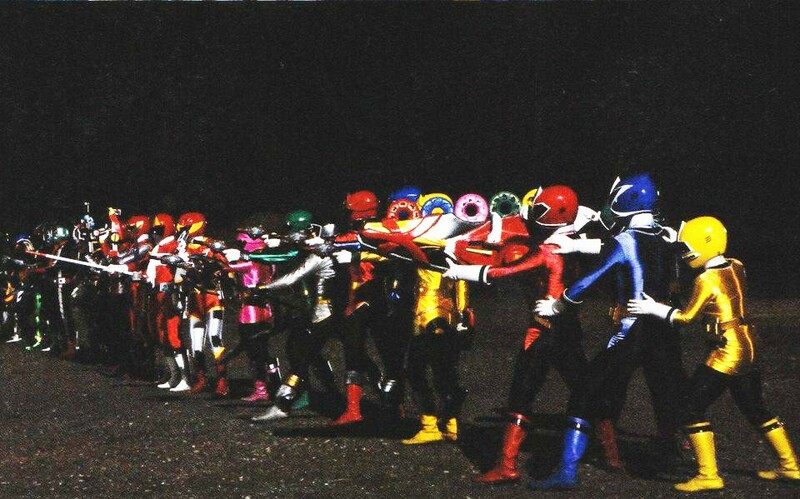 Two new scans for this year's crossover film, “Kamen Rider × Super Sentai × Space Sheriff: Super Hero Taisen Z” which centers around the appearance of the classic Metal Heroes in the film. 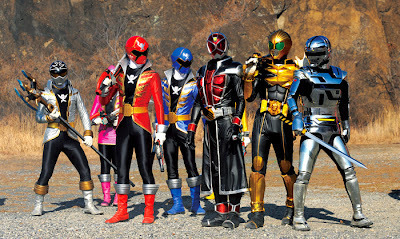 In reality, they are the Kaizoku Sentai Gokaiger. From the scan above, it seems that Geki Jumonji/Gavan -typeG- was the one who had acquired the Metal Hero Keys which he later gives to the Gokaigers. Similar to what the Gokaigers did with the Kamen Rider OOO's Rider Keys, they used the Metal Hero Keys to execute a "Special Charge" finisher! Super Hero Taisen Z: Kyoryuzin + WizarDragon's Special Kick! 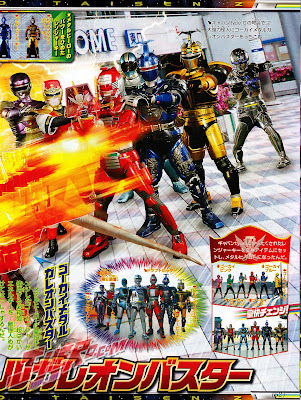 A new scan for Kamen Rider x Super Sentai x Space Sheriffs: Super Hero Taisen Z has surfaced online. The scan featured the special Kyoryuzin + WizarDragon combination and a folded version of one Metal Hero Key. Just like your average Ranger Key, the Metal Hero Keys will feature the logo of the series the said key is part of. 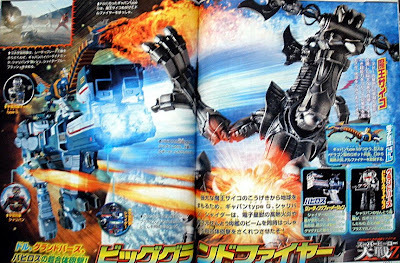 In addition, the scan also featured a full length shot of the Kyoryuzin + WizarDragon combination kicking Demon King Psycho. Produced by Shinichiro Shirakura (Super Hero Taisen), this movie is directed by Osamu Kaneda (OOO - Den-O - All Riders: Let's Go KAMEN RIDERS) and written by Shoji Yonemura (Kamen Rider Kabuto). 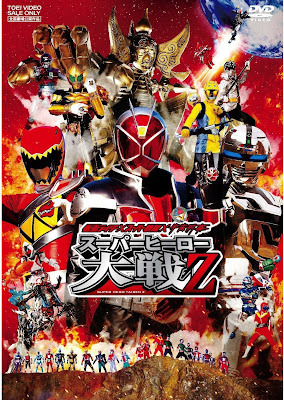 Super Hero Taisen Z premiered last April 27, 2013. Super Hero Taisen Z: Final Battle Shots, Metal Hero Keys in Action! More scans for Kamen Rider x Super Sentai x Space Sheriffs: Super Hero Taisen Z has surfaced online. Seen in the scan above are some of the key scenes in the said movie. 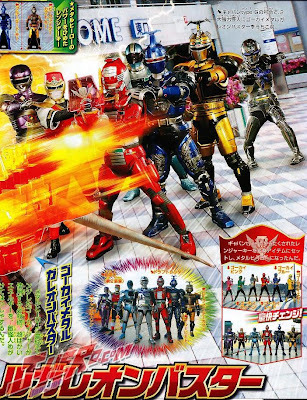 From what I can make up, Kamen Riders #1, Beast and Wizard Flame Dragon will do a Triple Rider Kick, Wizard and KyoryuRed doing shaking hands and below it is a picture featuring the "relevant" characters in the said movie. 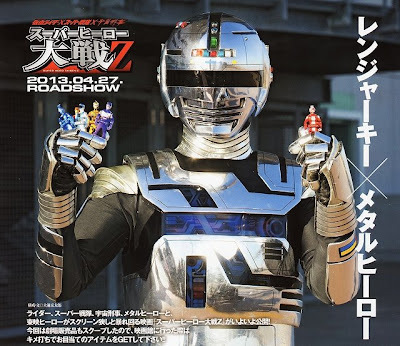 Here's a picture of Gavan typeG holding the Metal Hero Keys, which will be used by the Gokaigers later in the movie. 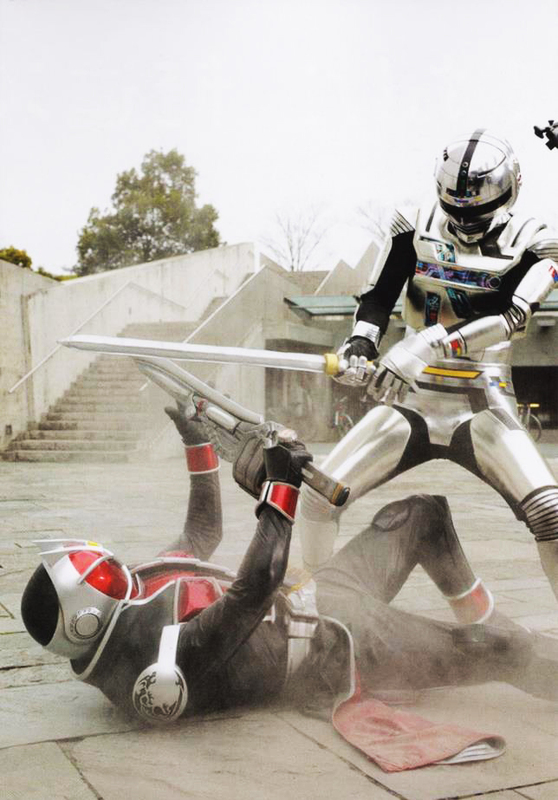 Below is an images of the Gokaigers and Gavan typeG doing a Gokai Galleon Buster finisher with the Metal Hero Keys! 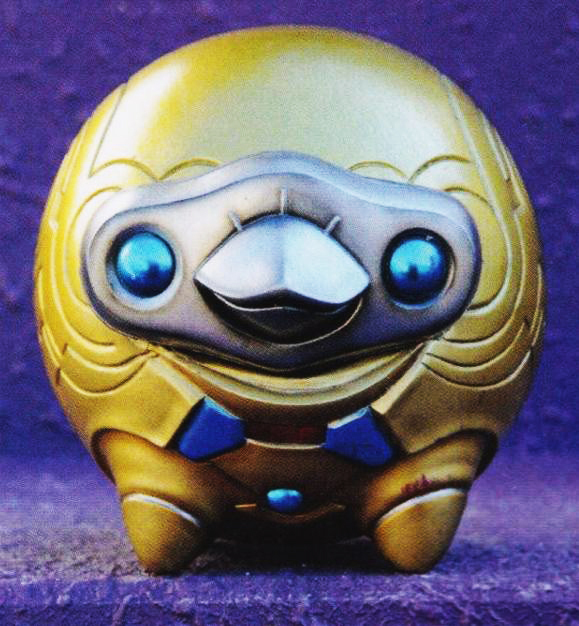 The Metal Hero Keys used in the movie and the respective hero using it are: Janperson (GokaiPink), Jiraiya (GokaiGreen), Jiban (GokaiSilver), Draftredder (GokaiRed), Blue Beet (GokaiBlue) and B-Fighter Kabuto (GokaiYellow). Weiss jemand wo ich hero taisen z angucken kann. Okay im Ernst. Du musst warten bis der Film auf DVD erscheint. Dann kannst in irgendwann ohne und mit Sub sehen. The home video release of this year's crossover film “Kamen Rider × Super Sentai × Space Sheriff: Super Hero Taisen Z” is scheduled to be released this October 11th. Managing to rank 3rd at the Japan Box Office Weekend, the film will be available in both DVD and Blu-Ray versions. The DVD costs 4000 yen, while the Blu-Ray will go for 5000 yen. Additionally, a "Collector;s Pack" will also be available for both DVD and Blu-Ray for 6800 yen and 7800 yen, respectively. Amazon Japan had released the cover jackets for the home video release of this year's crossover film “Kamen Rider × Super Sentai × Space Sheriff: Super Hero Taisen Z” that is scheduled to be released this October 11th. The DVD costs 4000 yen, while the Blu-Ray will go for 5000 yen. Additionally, a "Collector's Pack" will also be available for both DVD and Blu-Ray for 6800 yen and 7800 yen, respectively. Collector's Pack comes with a bonus disc featuring making-of, press conference footage, event footage, TV spots, data file, and poster gallery. Pre-order at CDJapan and get a FREE POSTER as a bonus. Hab SHTZ endlich mal gesehen und oh mann...der film war so viel besser als der erste Teil. Die Charaktere waren interessant und haben sich nicht komplett anders verhalten als sie es eigentlich müssten. Die Story war gut strukturiert und fühlte sich nicht wie eine schlechte Fan Fiction an die irgend ein 15 jähriger im Keller seiner Eltern geschrieben hat. Und ich muss den Film loben das er es geschafft hat das ich mich für Yoko und Nitou interessiert habe. Letzterer war sogar mein liebling im ganzen Film. Go-On Black hat geschrieben: Hab SHTZ endlich mal gesehen und oh mann...der film war so viel besser als der erste Teil. Hört sich klasse an, muss ihn mir unbedingt bald ansehen. ich hatte auch meinen spaß dran weil Gai aus Gokaiger recht viel zu tun hatte. Könnte mir Junya Ikeda einfach stundenlang ansehen. Schließe mich GoB an, ich fand den Film auch gelungen, trotz kleinerer Mäkel. Was mich ein bisschen enttäuscht hat war, dass nur Kotoha auftauchte, obwohl der Gavan-Cast noch Cameos von DenjiBlue/Battle Kenya und GekiViolet ermöglicht hätte. Auch dass am Ende dieses Mal nicht alle Sentai dabei waren fand ich schade. Insgesamt finde ich aber, dass wenn das Niveau so bleibt bzw. sich sogar noch steigen, Super Hero Taisen noch ein paar Jahre als Reihe fortgeführt werden kann. Go-On Black hat geschrieben: ich hatte auch meinen spaß dran weil Gai aus Gokaiger recht viel zu tun hatte. Könnte mir Junya Ikeda einfach stundenlang ansehen. DeXter hat geschrieben: Ich bin kein großer Fan von ihm, er ist mir zu anstrengend. Ich find die Akibaranger passen da aber nicht wirklich rein. Ich würde eher mit sowas wie vllt. Ultraman rechnen. 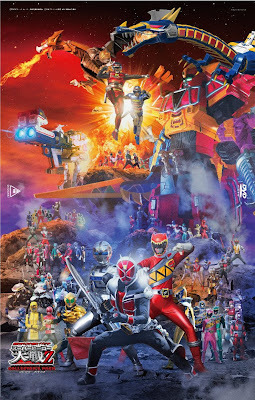 bei den Akibas ist halt auch die sache das Sentai in deren welt auch nur ne fiktive serie ist. Die SHT Filme wollen uns allerdings ne welt präsentieren in der alle Helden zur selben zeit existieren. Ultraman wäre eher möglich, dadurch das Ultraman momentan sehr präsent ist durch Ginga. Aber auch was das wir wohl eher nich kriegen dadurch das in SHT nur Toei Helden auftauchen. Könnte mir denken das Tsuburaya zu stolz is Ultraman dafür her zu geben. Mir würde es allgemein reichen wenn wir nur Sentai und Rider hätten. Go-On Black hat geschrieben: Mir würde es allgemein reichen wenn wir nur Sentai und Rider hätten. Ich finde Gavan auch nicht so cool, der eigene Gavan Film war okay, aber mehr auch nicht. Ich hatte mir mehr versprochen. Ich habe nun auch den Super Hero Taisen Z gesehen. 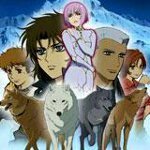 Hier sind meine positiven und negativen Aspekte des Films. Im Großen und Ganzen war der Film gut, aber von der Action her schlechter als SHT. Ich muss meine Bewertung vom SHT re­vi­die­ren, dieser bekommt eine 8/10 und der SHTZ eine 8,5 von 10. DeXter hat geschrieben: Ich habe nun auch den Super Hero Taisen Z gesehen. Hier sind meine positiven und negativen Aspekte des Films. Stimme dir im großen und ganzen zu. Bei mir kommt noch positiv dazu das Gai viel zur Story beigetragen hat. Gai gefiel mir hier besser als in Gokaiger, es ist als hätte er eine sehr gute Charakterentwicklung durch gemacht. Ich war von ihm positiv überrascht. Auch wenn er etwas viel auf die Tränendrüse gedrückt hat^^ Aber so geb ich dir voll und ganz Recht. Ich persönlich fand den zweiten Film um Längen besser als den ersten! Es war eine viel logischere Story, die Charaktere wurden überhaupt nicht verändert ( auch wenn Yoko etwas zu girlish geworden ist in der Schule). Allerdings fand ich es schade dass man außer Geki keinen der anderen beiden Space Sheriffs unverwandelt gesehen hat. So eine Diskussion auf der Raumstation untereinander hätte mir schon gefallen. ZiggyFan hat geschrieben: Allerdings fand ich es schade dass man außer Geki keinen der anderen beiden Space Sheriffs unverwandelt gesehen hat. So eine Diskussion auf der Raumstation untereinander hätte mir schon gefallen.